This is the F Page of our A to Z guide to plants -- how to care for them, landscaping with them, and cooking and healing with them. 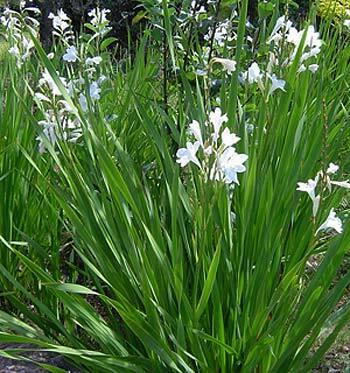 The small bulbs of the fairy lily multiply quickly adding to their always green eight inch tall grass like foliage. That alone would make them a plus for border or sloping garden plantings, but they also have delightful white flowers reminding me very much of the crocus in my New England spring garden of long ago. 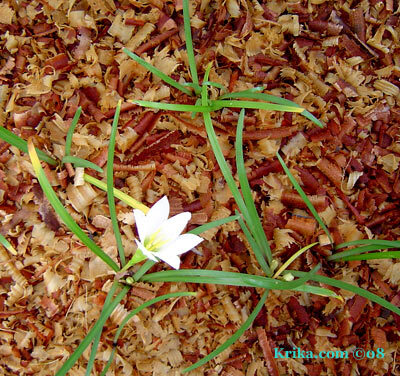 Benefits: The fairy lily is said to have some medicinal benefits. 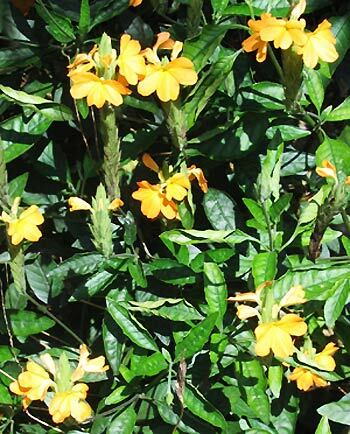 From: Southerly South America in swampy or marshy areas. 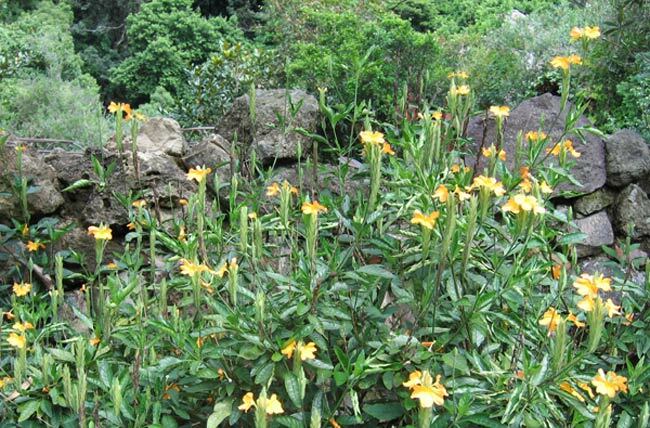 Photographed: In our wall garden by the driveway at our former home in Montserrat. Planting and Care: Plant the small, less than an inch in diameter, bulbs just about an inch below the soil surface in a sunny or semi shady area. It is said that they like regular watering or rainfall, but that has not been our experience. The plants did very well with very little water -- doubling the number of plants and producing lovely flowers too. False Sunflower, Asahi Sunflower, Oxeye Daisy Heliopsis Helianthoides "Asahi"
This perennial is a delightful addition in the garden. 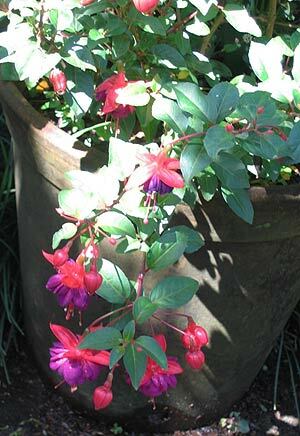 It is easy to care for and blooms continually for months. 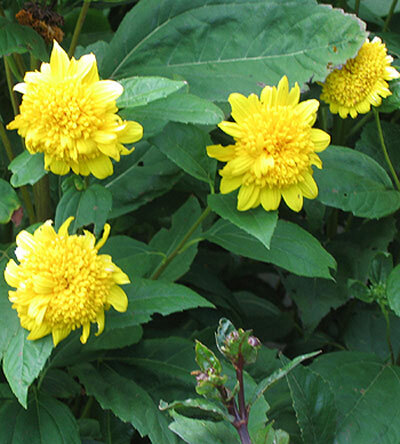 Benefits: This heliopsis is a butterfly attractant. Photographed: At the Winter Garden in Auckland, New Zealand, in 2013. Planting and Care: Plant heliopsis in full sun in cooler climates. In hot places it probably would prefer receiving only morning sun. It is adaptable to a range of soils, but it does like it on the moist side. Fava beans in English are called habas in Spanish and that was where I first learned to cook favas. I even grew them just to see what the plant looks like and I wasn't disappointed. It is lovely. This was one of my favorite plants in Montserrat and not just because it is impervious to volcanic ash and acid rain. I also tried to grow the bulb variety, hoping that it would be as happy there as the one we had that produced wonderful seeds and tender sprays of fine leaves for our salads, but it didn't work out. 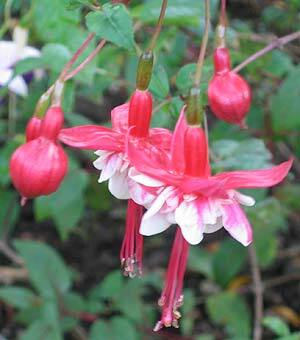 Luckily a few years later I was able to grow the bulb variety in our garden in Panajachel, Guatemala. Benefits: Fennel seeds have been used in many medicinal situations primarily relating to digestion. Chewing a few now and again also gives your breath an appeal. From: Primarily coastal areas of southern Mediterranean countries. 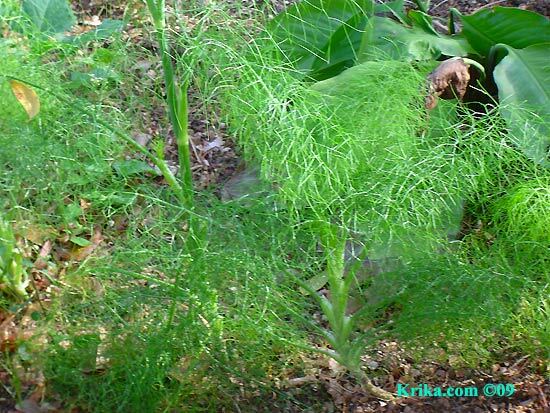 Planting and Care: Take seeds from your organic grocery herbal jar of fennel seeds and plant about four feet of a row in your garden. Plant the seeds about one inch below ground and keep them moist until the plants appear. They will grow to be about four feet tall and will appear as you see in the photographs. Snip a sprig or two for a salad every day, let the flowers go to seed and harvest them for your Italian cooking. 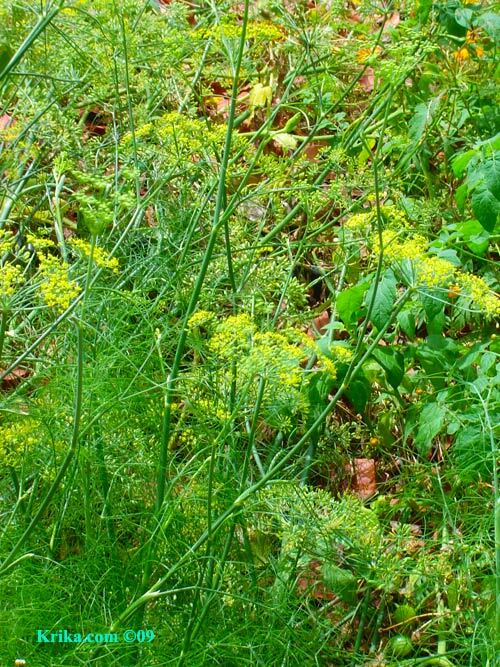 With no further work on your part, you will have a lifetime of fennel plants -- they self seed like nothing you have ever seen. Market in Palermo, Sicily, on a visit to Italy in 2012. 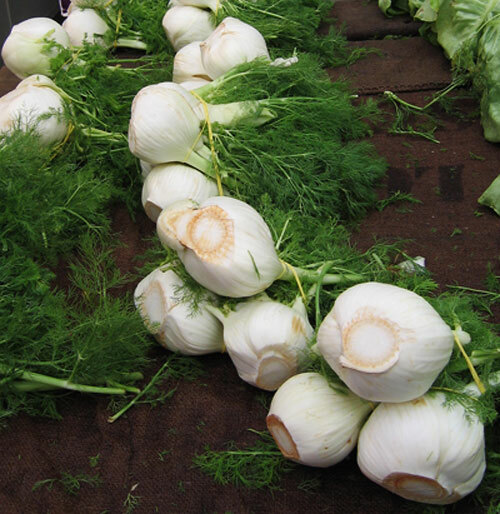 I was very surprised when first growing fennel that there are two varieties and only one creates the bulb that makes such a wonderful addition to the dinner table. 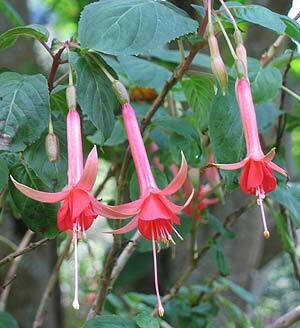 I had the seeding variety in Montserrat and now have the bulb variety in Guatemala. They are both beautiful plants. Benefits: Aside from the bulb being a delicious vegetable and the soft leaves being a wonderful addition to salads, fennel is said to provide a whole host of curatives. In fact from what I've just read, if you have a problem, fennel is the answer. BUT, talk to your doctor about it and use it in moderation because "some is good and more is not better. 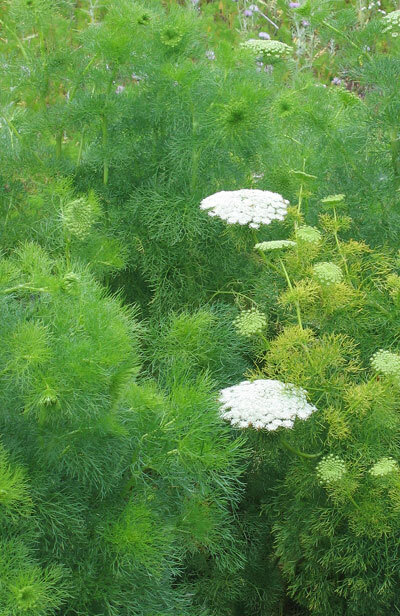 Planting and Care: This fennel can be planted and cared for the same as the one above, but be sure you have seeds for bulb fennel. 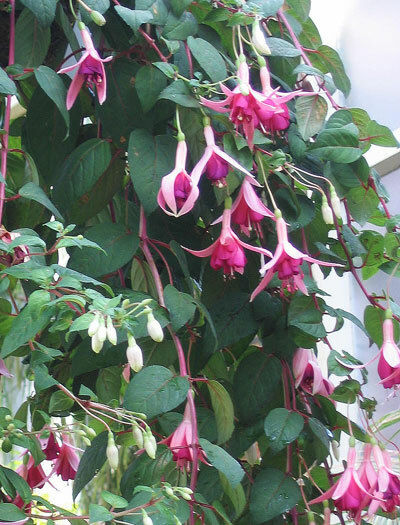 With its feathery foliage growing to be about 3 feet tall, it makes an especially appealing backdrop for flowers. It seems to me to be a relatively long season crop so it's perfect in the flower garden. Photographed: By the roadside in Sicily, Italy, in 2012. Before buying property in the Caribbean happily thinking you will have a year round productive vegetable garden you may want to do a bit of study on tropical gardening. If you live in the US, Florida is a good place to start your studies, but the Caribbean will confront you with soil inadequacies and viral and bacterial infections unlike anything you have ever seen. In every garden I ever had I used organic materials exclusively. In Montserrat the soil was of such extremely poor quality I can't imagine having a garden without the initial use of commercial fertilizers though I do draw the line at using commercial pesticides, fungicides and herbicides. We have added truck loads of chemical free sawdust and manure and we have used every bit of unwanted greenery we could get our hands on all buried in the garden -- still, at first it was not nearly enough. Soon after settling in on the island we became members of the Farmer's Co-op where for an annual fee we received a discount on farming supplies, mostly fertilizer and occasionally seeds as we don't use any their many types of very popular pesticides, herbicides and very commonly used animal poisons. Usually we bought bags of unbranded 12-24-12 from the Co-op along with Miracle Grow. When the 12-24-12 was not available, we used their only alternative 12-12-17. What the numbers mean is the percentage of nitrogen (which gives vigor and a lovely deep green color to your plants and lawn), phosphorus (which encourages root development and blossoming), and potassium (which gives plants strength or hardiness and which encourages blooms and fruit development). What is most wonderful about natural material compost is that it contains all the trace minerals and nutrients that commercial fertilizers sadly lack. So, in a tropical environment use as much natural material as you can find and manage and if you have no choice, make up the difference with commercial fertilizers as we did. I don't include many trees in this site, but this one caught my eye and came home with me in my camera. Ficus trees are known to be greedy which would normally put me off, but they are also striking in almost any landscape. Benefits: I found only a reference to this being an ornamental tree. Photographed: In the Royal Botanic Garden in Sydney, Australia, in 2013. Planting and Care: Because trees will be in the ground for many years and may dominate your garden area, I recommend that you contact the agriculture department at your local college or university. This ficus tree has the unfortunate gift of being so attractive it often finds itself growing in a pot, even a large pot, but never being set out to grow naturally. 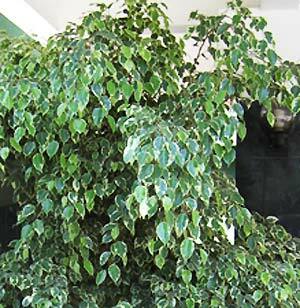 Ficus trees are lovely with dense amounts of shiny, leathery leaves, in this case with an appealing mix of white and green. They are great trees for shade and beauty, but they demand all of the water in the area and very little will grow under them. If you have the space for one of these beauties, think about making a sand set brick patio underneath with decorative plants set in pots to avoid competition. 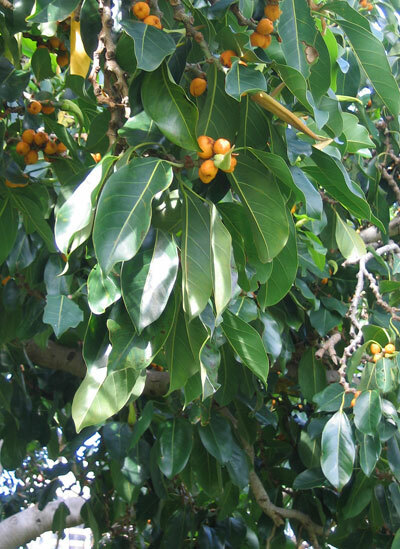 Benefits: This tree is believed to have a wide variety of curative health benefits. Photographed: At the entrance to the Hotel Riviera on Lake Atitlan in Guatemala. Warning: This tree is poisonous to cats and dogs. This very appealing small fruit bearing tree will grow to be about 30 feet tall, though most of those you will see in gardens or on terraces have been trimmed to keep them even smaller. 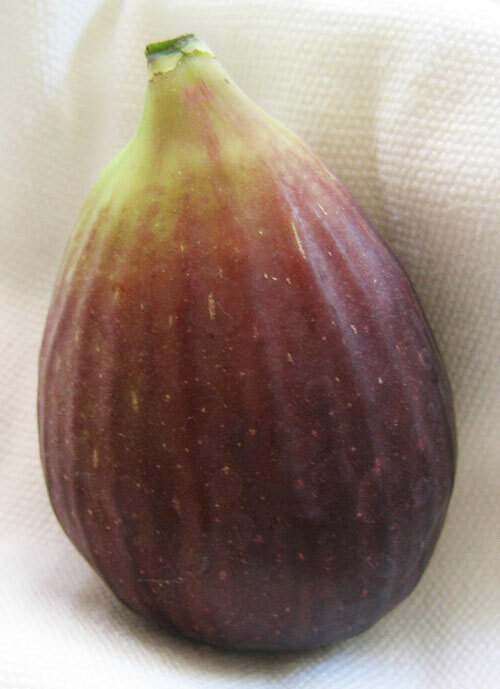 I am trilled to finally have one growing in the garden and it already has figs. Benefits: Figs are high in calcium and are good sources of dietary fiber, not to mention fig bars made in New England bakeries and commercially produced "fig newtons!" I just found a recipe for homemade "fig newtons" and will include it here if it works out. 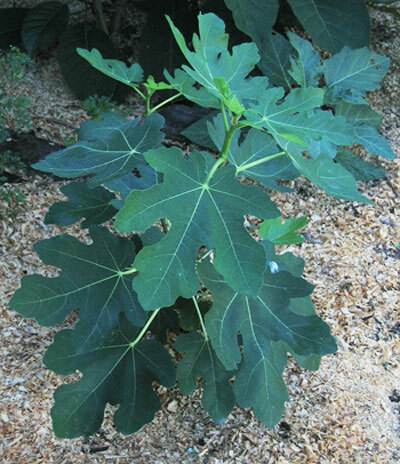 Planting and Care: Fig trees prefer a fertile well drained soil and routine rainfall or watering, though there are varieties that will live well on a lot less, even tolerating an extended dry season. Ideally soil should have a pH in the 6 to 6.5 range. Warning: The green parts of a fig tree may be skin irritants although I have not found them to be so. Planting and Care: This plant likes to live in relative shade, but will probably handle morning sun okay. With regular rainfall or water and abundant fertilizer, it should do just fine. 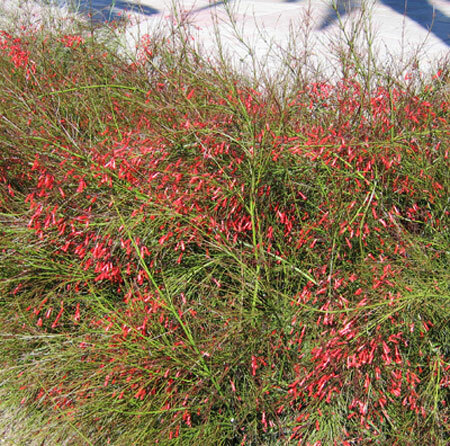 The firecracker looks more like an underwater plant than a land plant with its long thin stems and many tiny flowers. It was a special favorite of our hummingbirds in Montserrat until it was lost to the volcanic eruption in July 2003 when four inches of wet volcanic ash covered our former home and our entire property. With a bit of luck and a neighbor's generosity we planted another firecracker and it was doing very well when we sold the property. Blooms: More or less continuously the year round. and Arboretum in Bristol, RI, in the USA in 2014 and below as noted. Planting and Growth: Plant it in full sun in a space that will accommodate its ultimate size -- about four feet high and three feet wide. 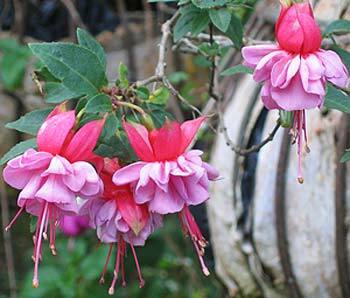 It will grow happily with or without regular rainfall and occasional pruning will encourage more flowers. 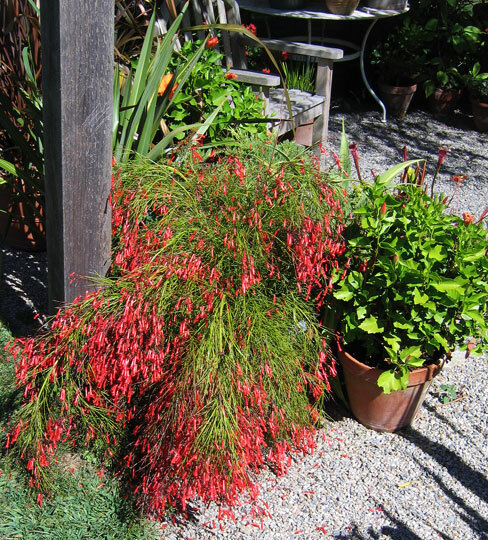 The firecracker is a sloppy sort of plant that should find a home in the garden where formality is not essential. It might be at its best planted so that it "falls" over a low wall. Photographed: In the city garden in Malaga, Spain, in 2012. 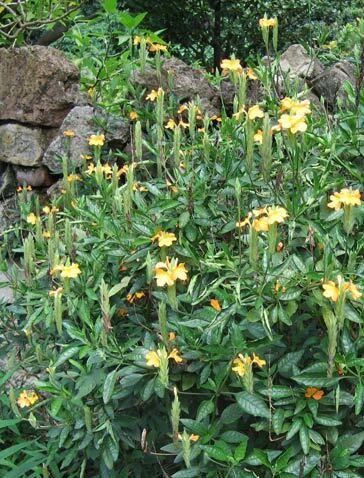 This is a very appealing bush/shrub with interesting foliage and attractive yellow flowers. 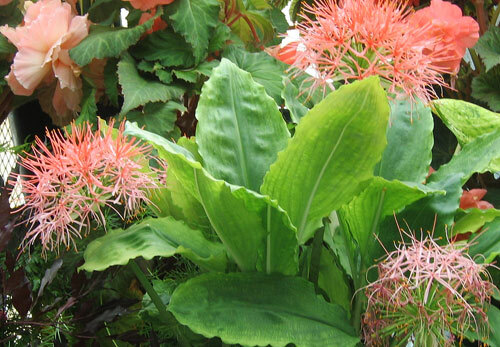 Benefits: This is a plant with curative qualities, some of which are said to be very effective. This is no longer one of my mysteries thanks to Beth in San Antonio, Texas. Benefits: These are hummingbird and butterfly attractants. Photographed: In the Carlos Thays Botanical Garden in Buenos Aires, Argentina. Planting and Care: Firespike will grow to be about 4 feet in height. 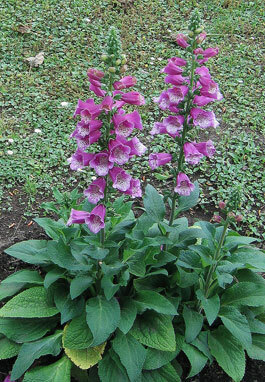 They like well drained rich soil with lots of compost and are tolerant of pH levels at or near neutral. The best part is that they love to live in full sun and will provide you with lots of flowers if that desire is met. 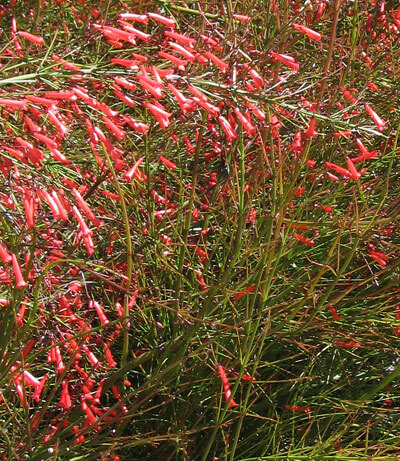 Firespike are not frost tolerant, but they will do alright in relatively dry periods. **Fit Weed, Coriander, Cilantro, Ram Goat Bush (in Montserrat) Eryngium foetidum L.
This is an attractive very sharp edged plant growing wild in Montserrat and used by the local Indians as fresh coriander and by folks from Santo Domingo as fresh cilantro neither of which is regularly available in the island's supermarkets. 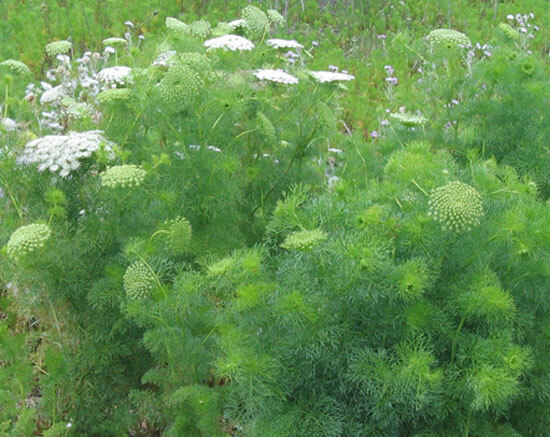 Benefits: It is commonly used as a digestive tea and in cooking as a flavoring almost equal to cilantro. Photographed: Below on the left in our herb garden at our former home in Montserrat in 2008 and on the right in the market in Scarborough, Tobago, in 2018. 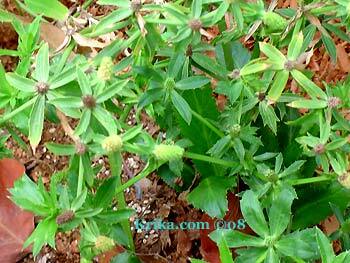 Planting and Care: Fit weed can be found growing wild in semi shady moist areas. If you bring it into your garden provide it with a similar environment -- light shade and moisture. It spreads wide rather than grows tall, never reaching more than eight inches in height. Be careful touching this plant as there are hidden sharp edges that can be unpleasantly surprising.. Happily it will self seed with no help from you. 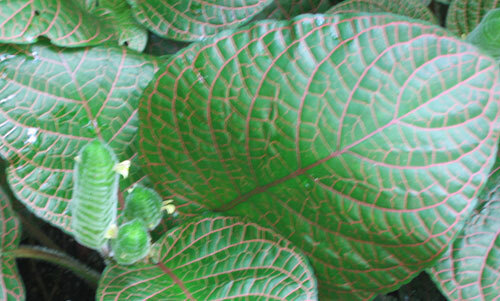 Benefits: Fittonias can be helpful in clearing household air of unwanted contaminants. 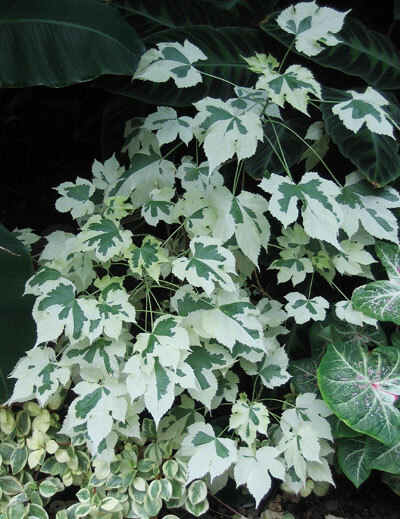 Planting and Care: As an indoor plant, fittonias will grow best in bright light with high humidity. As they are often sold as hanging plants, a window with indirect sun would be perfect. Its roots are not deep so a medium sized pot with a good potting soil should be just fine. Water when dry and keep it out of drying drafts. To keep it looking full, give it a trim now and then. As an outdoor plant its requirements are just about the same. It needs a warm not hot garden setting in a deeply shaded area. 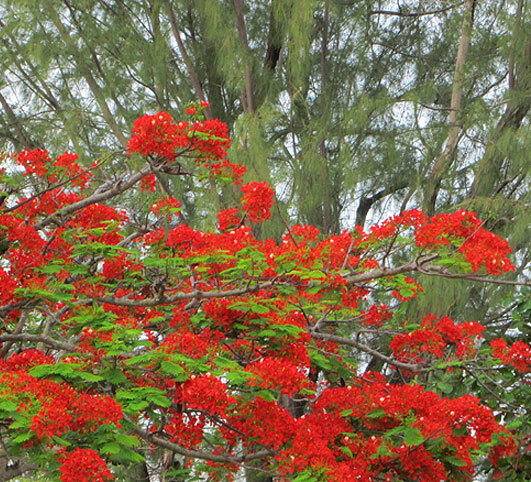 The deciduous poinciana can grow to 50 feet, though the ones here in Montserrat never seem to get that tall. 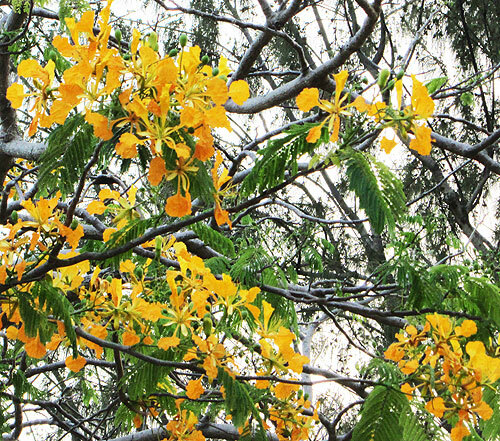 Even so, its branches seem to spread as wide as the tree is tall with feathery leaves resembling ferns. 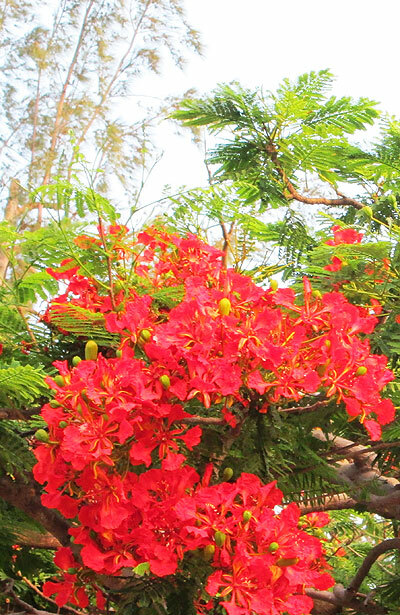 In our garden on the island, our poincianas usually begin blooming in mid-May and continue through July. 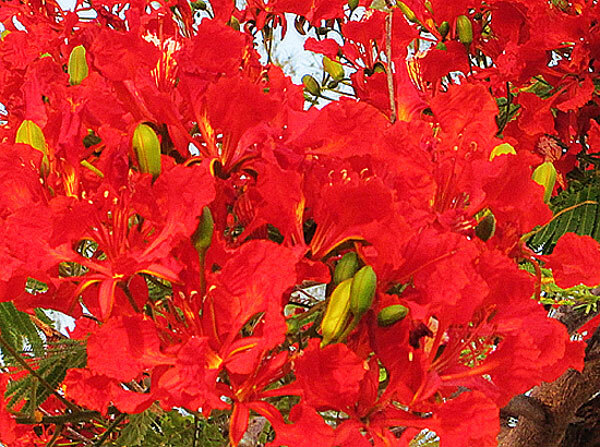 We have two red and one orange flowering tree, all of which are very beautiful. Some of last season's long flat seed pods, often more than one foot in length, remain on the trees as the new flowers appear. 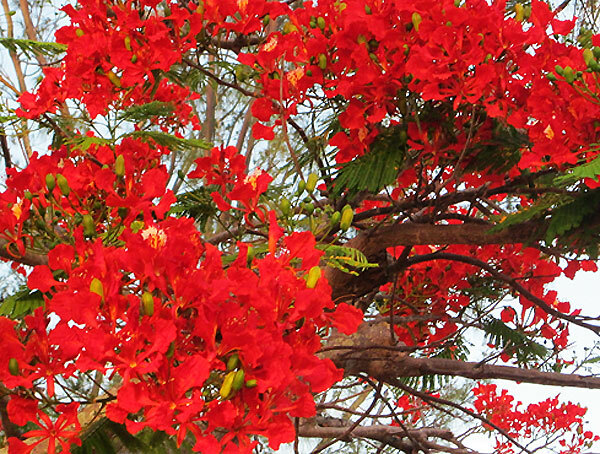 Poincianas could be easily mistaken for jacarandas until they begin to bloom. Photographed: In May and June in Crown Point, Tobago, in 1918. Planting and Care: These lovely trees seem very tolerant of light variations growing well in full sun or in shade, but they do seem to prefer regular rainfall. Sadly, they are EXTREMELY vulnerable to termites so they are best planted in very sunny and even slightly dry areas. Whenever we saw a termite track on one of our trees we spread boric acid on the ground after rubbing off the track, exposing the termites to sun. We tried using a strong soap solution, but it seemed to have had no affect on the termites. This is a flower I remember well from childhood school days. One of our youthful projects was to plant seeds in the soil filled bottom half of a milk carton and see what happened if we took care of them for a week or so. I remember being terribly disappointed at the show the flowers made and wished that the teacher had chosen something more exciting. When I saw them growing at Thuya, I was reminded of those early years of gardening. 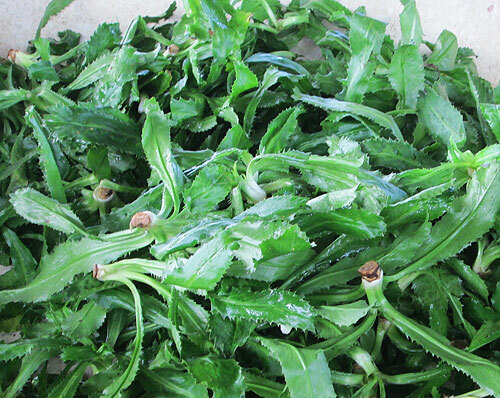 Benefits: Parts of this plant are used externally in the treatment of skin disorders. Planting and Care: As you can tell from my comment above, this is an easy plant to grow. It is considered an annual because it is not frost hardy. 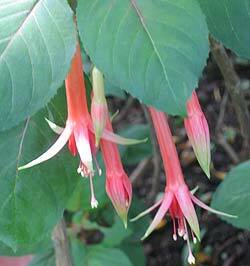 This isn't a stunning plant, but it is lovely with its gently drooping flowers and its appealing foliage. It comes with flowers in many colors so there is at least one you will find fits perfectly in your flower garden. 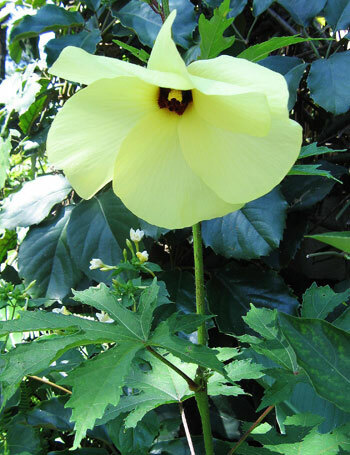 Benefits: Flowering maple is best known for its attraction to hummingbirds. With even one of these plants in your garden, you are almost certain to have hummingbird visitors. Photographed: At the Hotel Atitlan and the Hotel Regis at Lake Atitlan in Guatemala. Planting and Care: This easy to care for plant will do well in full sun with regular rainfall or watering, but don't let it sit in wet soil. 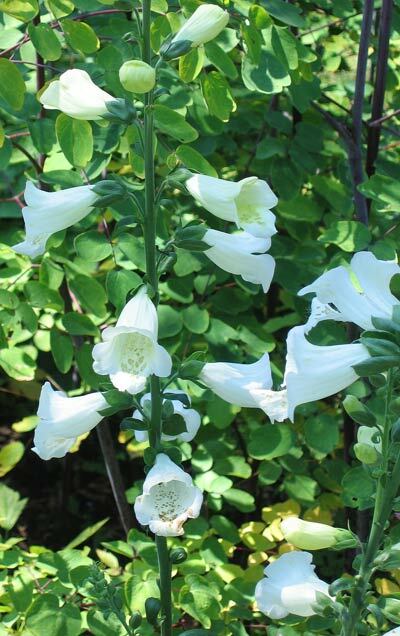 This perennial beauty has pale peach colored flowers and will grow to be 4 feet tall or a bit more. It will be about as wide as it is tall so give it room to grow. It will bloom best in spring and fall. Benefits: Its flowers probably attract hummingbirds. From: This is a hybrid plant. 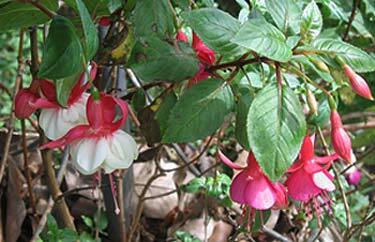 Planting and Care: Abutilons like reasonably warm climates and are not winter hardy. They like fertile soil, lots of moisture and will do best in a place where they receive morning sun and afternoon sun. With my appreciation, my #32 plant mystery was identified by Peter from Auckland, New Zealand. 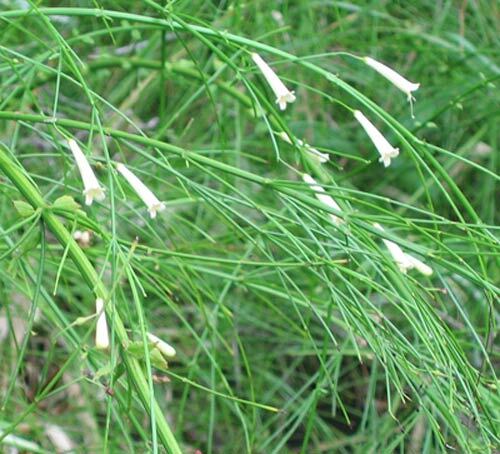 These flowering plants have bright light green leaves and are covered with flowers which open only in the late afternoon. 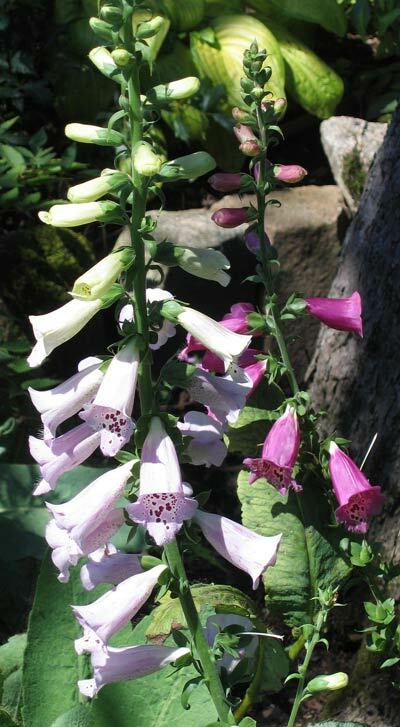 The flowers come in a variety of appealing colors and all together the plants make welcome additions to the garden--easy to care for, continually blooming and very attractive. 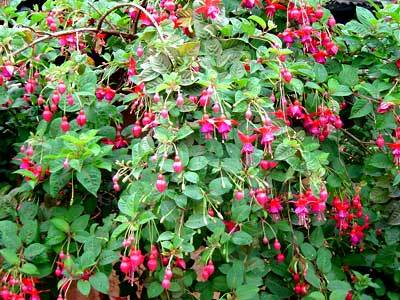 Benefits: The abundant small flowers attract both butterflies and hummingbirds. 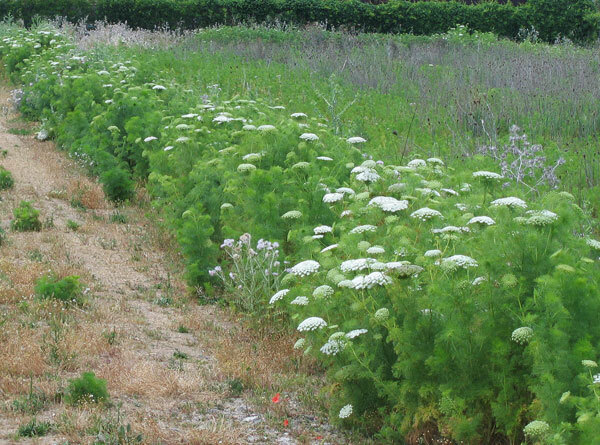 And, perhaps more importantly, the plants have multiple applications in herbal medicine around the world. 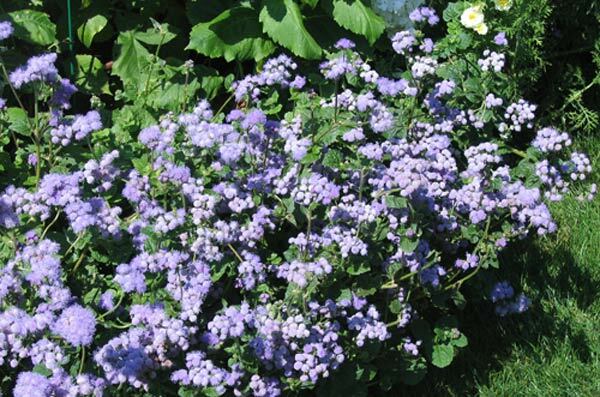 Planting and Care: These 18 to 24" shrubby plants are common in summer flowering beds in cold winter climate places. In cool places like that plant them in full sun in good soil and be sure they receive routine rainfall or watering. 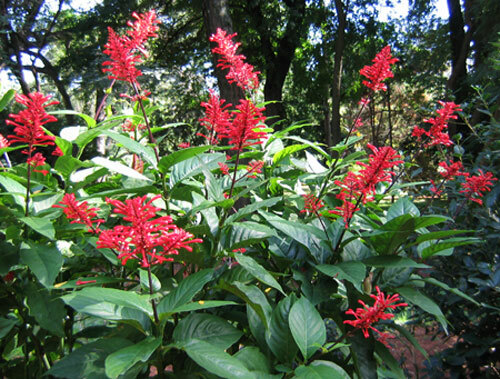 In the tropics they are perennials and are best planted where they will be sheltered from the hottest mid day sun. Photographed: In the Naples, Italy, Botanical Garden, 2012. 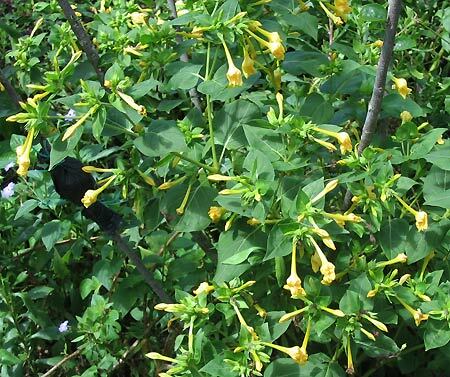 This is a beautiful biennial flowering garden plant as you will see in the photographs, but it is not without its downside as you can read below. From: Southerly western Europe and Asia and northwest Africa. Planting and Care: Plant it in full sun and give it routine watering or rainfall. It is not a difficult plant to grow. Warning: Eating any part of this plant will be very dangerous to your health. Symptoms may include severe stomach and intestinal distress, but may also be more life threatening beginning with hallucinations ending in delirium and maybe death. "Twenty minutes after a little nibbling, nausea, vomiting, and diarrhea set in. Depending on the amount ingested, untreated poisoning leads to death by bradycardia (lowered heart rate) or ventricular fibrillation (a rapid, irregular rhythm in the lower heart chambers). Keep in mind, however, that children have died just from sucking on a part of the plant." Photographed: In our apartment in the city of Oaxaca, Mexico. I remember freesias well from my working years in Washington, DC. 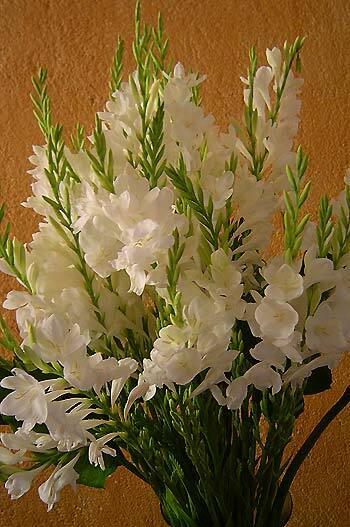 There the freesia is a coveted and expensive cut flower often used in extravagant floral bouquets. They are equally or maybe more beautiful growing in a field. Benefits: If you would like an added bit of happiness in your life, buy freesia flowers or essential oils. I'd opt for the flowers as just looking at these photographs makes me a little happier. Planting and Care: Freesias are not frost hardy though they are a little fussy about hot sun in warmer climates. 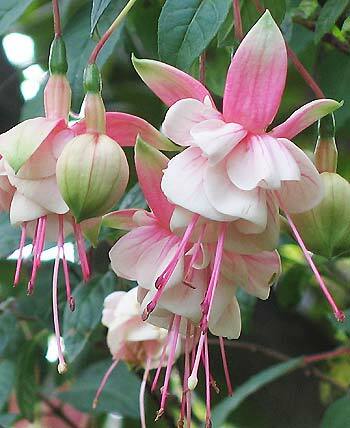 Plant them in rich loamy soil in a place which receives lots of moisture and is shaded from mid day sun. You won't be disappointed. Photographed: In a field in San Jose del Pacifico high in the mountains of the State of Oaxaca, Mexico. 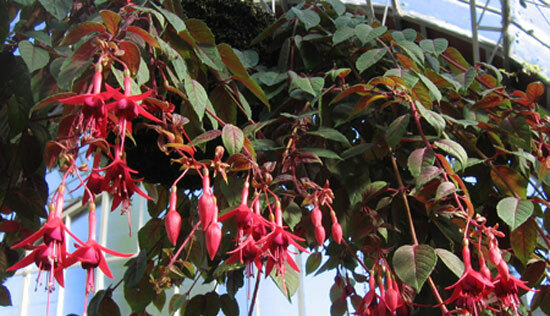 Some years ago I had a wonderful opportunity in a small town outside of Taxco, Mexico, to see what a fuchsia can turn into in the right hands. The lady of the house we visited sells flowers in the Taxco market on Saturdays. The rest of the week she is at home in her true wonderland of flowers. She has one of those special characters that plants respond to as if they were under Eve's care in Eden. 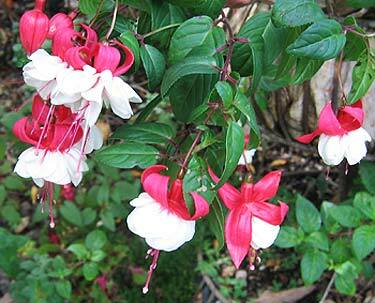 Her fuchsias were not only covered in blooms, but covered almost the whole front of her house -- remarkable! 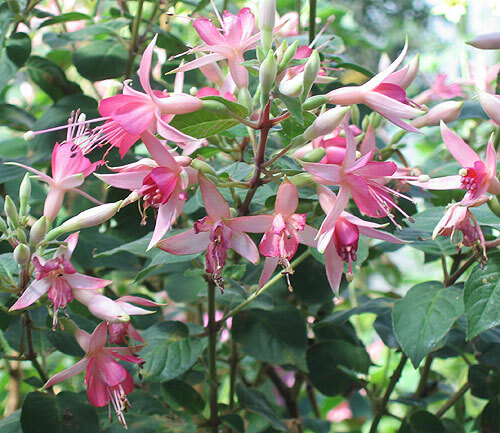 Benefits: Fuchsias are hummingbird attractants. Their flowers are edible and can be used to decorate salads or other summery foods. Photographed: In Tenerillas, about an hour's drive outside of Taxco, Mexico. Planting and Care: They like moist well drained fertile soil that is slightly acidic and will grow well either in full sun or in a partly shady spot. 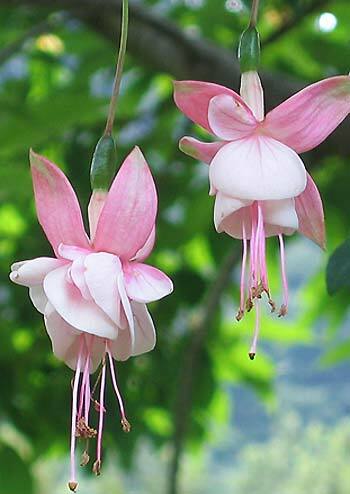 I would recommend you plant or hang them where they will receive only morning or afternoon sun. They need shelter from hot winds and like to be pruned after flowering. 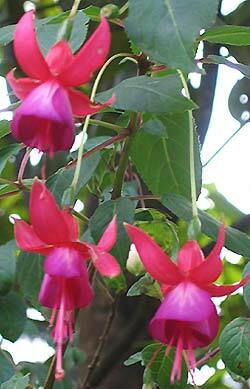 Photographed: In the Botanical Garden at the Hotel Atitlan on Lake Atitlan in Guatemala, in 2010. Photographed: At the Hotel San Buenaventura on Lake Atitlan in Guatemala in 2010. 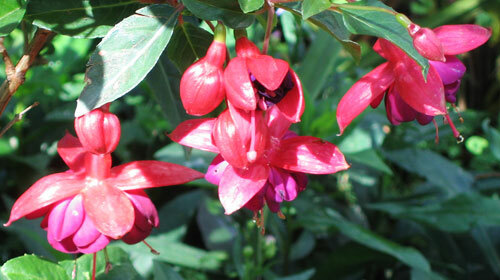 Photographed: In the Botanical Garden at the Hotel Atitlan on Lake Atitlan in Guatemala in 2010.